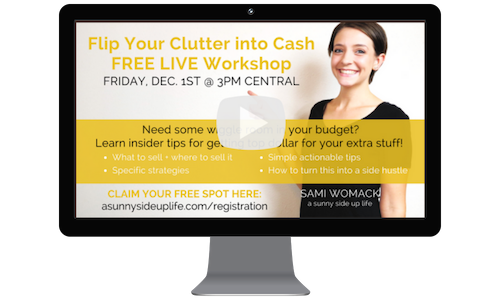 FLIP YOUR CLUTTER INTO CASH? Check out my recorded workshop! Need some wiggle room in your budget? Learn insider tips for getting top dollar for your extra stuff! I know how important earning some extra income is to your family + I want you to know that I understand it can be overwhelming...that's exactly why I'm offering this workshop! I'll cover everything you've been wondering about....you'll leave the workshop with tons of info and feeling ready to sell your unneeded clutter for some much needed extra cash!